Sam must have run out and bought this in the week and a half he was away from Dean, because the first time we see it is in The Mentalists (7x07). Sam wears it at the end of the episode as he and Dean talk in the cafe and then leave town. In Bad Boys (9x07), Sam wears this shirt when he and Dean arrive at Sonny’s farm and begin investigating. He keeps it on until after he and Dean torch the bones they believe belong to the ghost, and then changes out of it before he and Dean go to the diner. What is with the one-time shirts?! 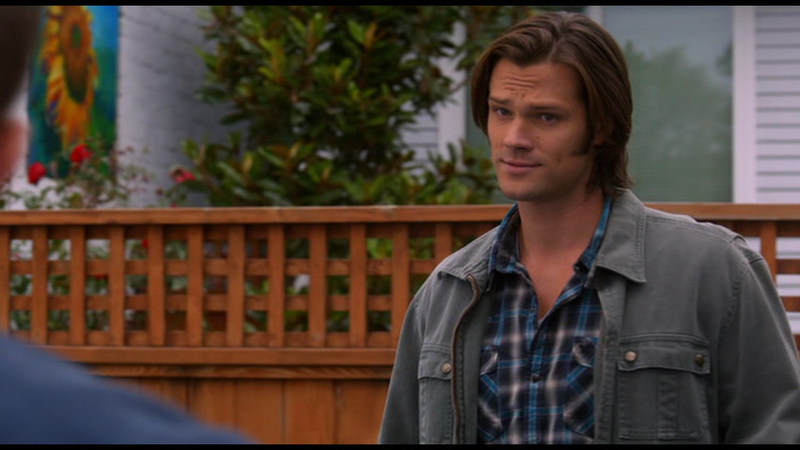 Like you have money to blow on new plaid shirts, Sam? Actually, I'm curious--are the boys rewearing old season shirts too, and where would I find your comments on them? Haha, yes! They are rewearing old season shirts too! To see which ones, you just have to go to the Season 7 list. It's completely updated with all the old clothes, the only clothes I still have to add to it are new ones...so they're all there. Sam is the worst for one-time only shirts though. I should probably add a chart to show what % of his wardrobe is one-time only at some point. It'd be interesting...especially in comparison to Dean, who has very very few one-time only shirts. That being said, some of Sam's S3 one-time only shirts were suddenly worn again in S7, so who knows - these shirts may still have future appearances. That said, this one does look nice oh him. Blue is a good color for Sam, I think. I wonder if Sam shops when he's lonely...awww. Tsk, tsk. That Sam must be awfully hard on his clothing! All those one-time wears. I own that shirt and it is so much more beautiful in hand. Yeah, I think the show's colour filter ends up making a lot of the shirts look less beautiful than they are irl. Though, it does make me wonder how bright the more garish shirts must really be.